Now it's easy to engage and inspire everyone in the room. With the Sharp PN-C605B interactive display systems you have the ideal focal point for meetings, presentations, or lessons. Direct bonding technology makes the touchscreen feel and appear impressively natural to users and viewers. Smart and convenient SHARP Pen Software facilities discussions and real-time information sharing. Thanks to multi-touch sensitivity, up to four people can write freely on screen at the same time for effective and lively exchange of options. And handy front-access buttons enable quick operation of common functions. 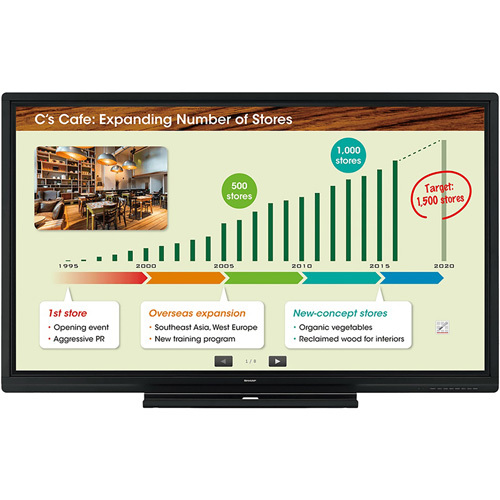 With the PN-C605B interactive displays, it's easy to create, learn and share more effectively.